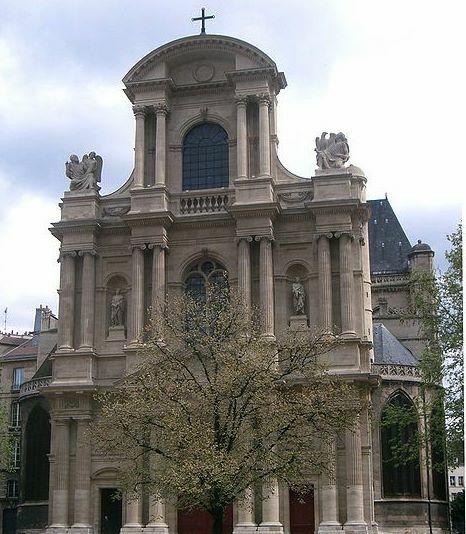 One of the oldest parishes in Paris, the Church of St Gervais and Protais has been mentioned in records as early as the 4th century. A wonderful and rich history envelopes the neighborhood and nearby can be found some of the oldest houses in Paris. The present Church dates to the late 15th century. The chapels in the apse of the church date from about 1530. The doorway of the church was finished about 1620. The square in front of the church is called the Place Saint-Gervais, but was called for many centuries the Crossroads of the Elm. Since the Middle Ages an Elm tree has grown there. The Elm was a gathering place for neighborhood affairs and business, a plcae where people would also exchange money. There are pictures of this elm in the stalls of the church, and on some nearby buildings. Since 1975 the monastic community of the Fraternity of Jerusalem has administered the church. The Divine Office is said there during the day. At the rear of the Church you will find a few shops where the Monastery sells goods that it has made and that help support the community and it's work.